The terribly violent, yet hopeful activity that began in Tunisia in 2011, went through Egypt, Libya, continues now in Syria and most likely will extend further. How much further? Iran? Will the resulting states be strong democratic governments or extreme Muslim "shariah" states? As a result, Arabs living in these countries are either uninformed or misinformed. They are unable to adequately address, much less publicly discuss, matters that affect the region and their day-to-day lives. A state-run narrative dominates the public psyche, and while many do not believe it, a large majority of the population falls victim to this false narrative. Sadly, this situation is unlikely to change. The Arab world was ripe with hope during the spring of 2011. 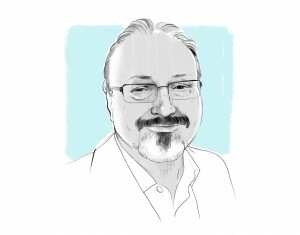 Journalists, academics and the general population were brimming with expectations of a bright and free Arab society within their respective countries. They expected to be emancipated from the hegemony of their governments and the consistent interventions and censorship of information. These expectations were quickly shattered; these societies either fell back to the old status quo or faced even harsher conditions than before. My dear friend, the prominent Saudi writer Saleh al-Shehi, wrote one of the most famous columns ever published in the Saudi press. He unfortunately is now serving an unwarranted five-year prison sentence for supposed comments contrary to the Saudi establishment. The Egyptian government’s seizure of the entire print run of a newspaper, al-Masry al Youm, did not enrage or provoke a reaction from colleagues. These actions no longer carry the consequence of a backlash from the international community. Instead, these actions may trigger condemnation quickly followed by silence. A great stabilizing element in the Middle East may very well be the education of girls and women. There are strong barriers against this goal, with many families — particularly those living in poverty — being unable to send their daughters to universities, secondary school or even primary school. The cost of forgoing another helping hand at work or at home may simply be too high. Additionally, there is a stigma that women's education has a lower rate of return due to the idea that women will not use their education to pursue work outside of the home. All these reasons contribute to the pressure on girls and women in Arab states to marry while they are still very young. Marriage at this stage leads to early childbearing, which can pose significant health risks for the infant after birth. Arab-dominated countries are making historic progress. - Leading the pack in improvements to primary school participation are Morocco and Algeria, both of which have over 96 percent participation rates among girls. - Trailing behind are Djibouti and Yemen, two countries whose participation rates have risen by 20 percent in primary schools. Djibouti and Yemen report 55 percent and 78 percent in enrollment among girls, respectively. With the Middle East and North Africa (MENA) region conference approaching and the 2015 Beijing conference, it is more vital than ever to stress the cultural evolution of women\'s role in society. Education Improvements must be available to girls, even in the most poverty-stricken areas of the Arab world.